The best custom upholstery and custom window treatments begin with the best fabrics. That’s why MBU Interiors has sought out the absolute best decorator fabric companies. We have hundreds of options available for you to choose from with upholstery fabrics, vinyls, leathers, Naugahydes and drapery fabric, linings and trims. When you choose our in stock styles, we’ll take 50 percent off the price of materials. If we don’t have the perfect fabric for you, we can order it to give you exactly what you desire. When you choose MBU Interiors, you don’t have to make the decision about which fabrics are the best fit for your home on your own. Our design team brings years of experience to any project and will provide you with the advice that you need to choose the right fabric. Contact us today by email or phone to schedule a consultation either in your home or at our shop. 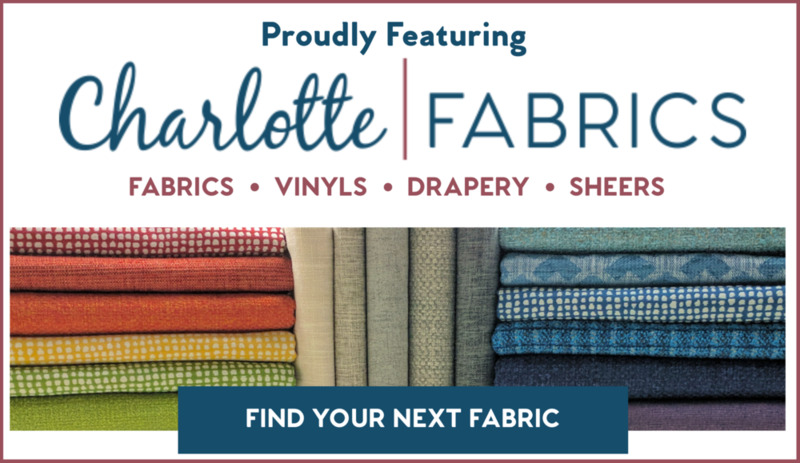 If you would like to review some of the amazing fabric choices by Charlotte Fabrics, click on this image below. They have a full range of fabrics that can be used for new furniture as well as for reupholstery projects. Through this link, you can search by dominant color, type of material and even by the type of pattern. We have many of these fabrics in stock, and anything that is shown on their website is available for custom order through MBU Interiors.